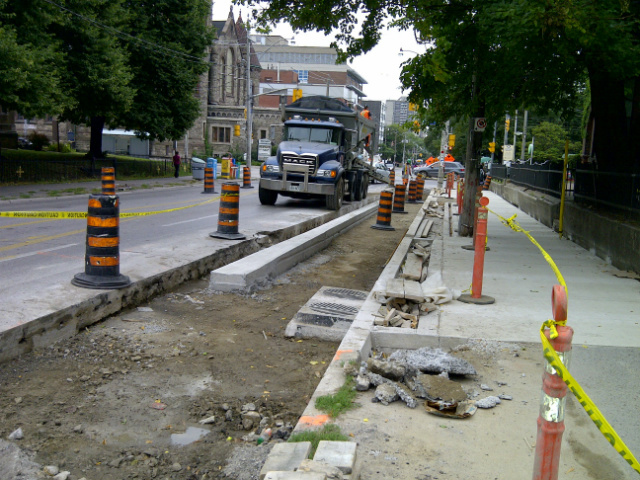 Photo of the Queen's Park Cycle Track getting built courtesy of the City of Toronto. From a distance, installing bike lanes might seem as simple as bucket of paint and a ruler, but the reality is different. “Some people don’t realize how much goes into it, you can’t just go out and paint it,” City cycling manager Jacquelyn Hayward-Gulati told Torontoist. In the research phase, the curb-to-curb distance on a street is measured in order to determine what kind of cycling infrastructure can be accommodated, whether it be a cycle track (separated from vehicle traffic), a designated lane, or sharrows. The traffic right of way and the connectivity to other bike lanes are also considered. Traffic volume counts are conducted mid-block and traffic turning patterns are also analyzed. Increasingly, the City counts the number of cyclists using a roadway before infrastructure is implemented and after it has been built in order to determine how a lane or cycle track affects bike traffic.